Here are some of the best ones from 2012 and a few from way back when. You’re so Nashville if you can’t actually identify the items in your weekly delivery of organic CSA produce. 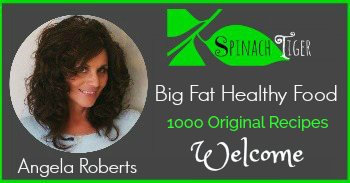 —Debbie Settles (When I moved here 14 years ago, the clerk at the grocery store couldn’t identify half of my produce. Honey, that’s eggplant). You’re so Nashville if the characters in your church’s Nativity scene look exactly like Fleetwood Mac. —Matt North (And you’re so Nashville because you know what a Nativity scene is). You’re so Nashville if you never meant to stay here this long. —Robert Jetton (The fate of 50% of us who now live here). I was challenged to cook vegan. I admit, this didn’t make me happy, at first. But now I’m so glad, because I learned a lot and I’m proud of my contribution. It made me step out of my comfort zone, and stretch myself, even if I still stayed true to my cooking viewpoint. It’s a very spicy chicken typically served with a slice of white bread and pickles, first made by Andre Prince of Prince’s Hot Chicken which is legendary, including the one hour wait, as hot chicken must be prepared fresh and is spiced right as it comes out of the deep fryer. This year’s January edition of Food and Wine Magazine did a feature called Nashville in 10 Plates, and Hot Chicken at Hattie B’s is the first bite they mention, as there are now several “hot chicken” places around town. I’ve also heard that Bolton’s is one to try. I did a little research to see how hot chicken was made. Marinated in buttermilk, the chicken is floured and deep fried. Lard and cayenne pepper are mixed into a paste and then rubbed onto the fried chicken while it’s still hot. Some of the hot chicken served around town is so hot, men cry. My first hot chicken experience was from the Biscuit Love Truck and I was immediately smitten. I graduated to hot fish at Puckett’s Boat House and had to go back a week later to have it again. Whatever fancy schmancy food comes to Nashville, people will seek out folksy food with Southern roots. Although this is vegan and it’s tofu, I’m sure that the Nashville foodies would embrace it. Instead of lard and cayenne, I chose sriracha sauce to smear onto marinated and chicken fried tofu. While deep frying is necessary for hot chicken, I’ve seen “hot” fish served either fried, blackened or grilled and you can do the same thing with the tofu. I loved my spicy tofu. I ate every piece I made, and thought it was equally good with the pickles or kale salad, as the important thing is pairing it with something acidic. A friend sent me some homemade sweet and spicy pickles for Christmas, which were so unusual with a crispy bite and spicy hit and just spot on as an accompaniment. It took me three tries to get this tofu dish right. I’m just lucky enough to have a great foodie friend living next store, who happens to be Asian, and just happened to have just purchased Andrea Nguyen’s cookbook, Asian Tofu. It’s a fabulous book that, while approachable for the tofu novice, holds enough meat for foodie geek that I am. After two tofu failures, I read through Andrea Nguyen’s tips and got it right. The surprise part was in the initial seasoning of the tofu. After cutting 3/4 inch squares of extra firm tofu, it is placed in a shallow dish followed by salted boiling water which must completely cover the tofu. After 15 minutes, the tofu is then placed on a waffle cloth (or paper towels) covered and drained of moisture. One of my failures was trying to get bread crumbs to stick to the tofu to get a crispy, crunchy crust. Andra recommends potato starch to pan fry or deep fry tofu. I used corn starch, which worked out perfectly. In further experimentation, I fried the tofu two ways. First, I used a cast iron pot and deep fried the tofu. This works well. The corn starch sticks to the tofu and unlike flour, doesn’t burn. In one of the other recipes in the book, tofu is pan fried in a non-stick pan. 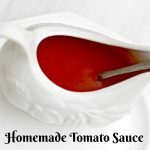 I tried this method, still marinating and using corn starch and I was happy to discover that it tasted just as crispy and good as the deep-frying method. This is how I’ll write the recipe. It’s healthy, and the only way I’ll prepare it from now on. In searching for the white bread for the hot tofu, I found mini rolls, called silver dollars. 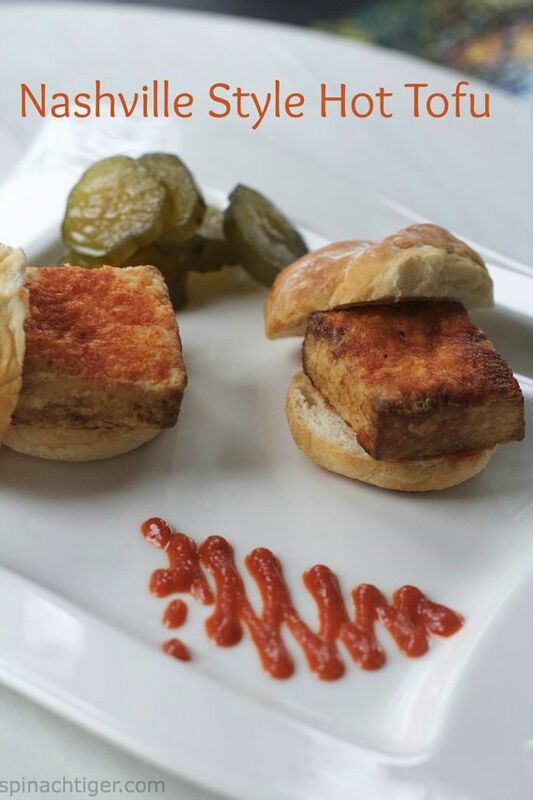 Thus, hot tofu, Nashville style, became Hot tofu sliders. The proof in the worthiness of this dish is my friend’s text. I delivered this basket to her and she texted back, “delicious,” and the foodie geek in her asked me a bunch of questions as to how I executed such a great snack. We agreed that in the very near future, we are headed to one of the joints in Nashville that is famous for hot chicken. 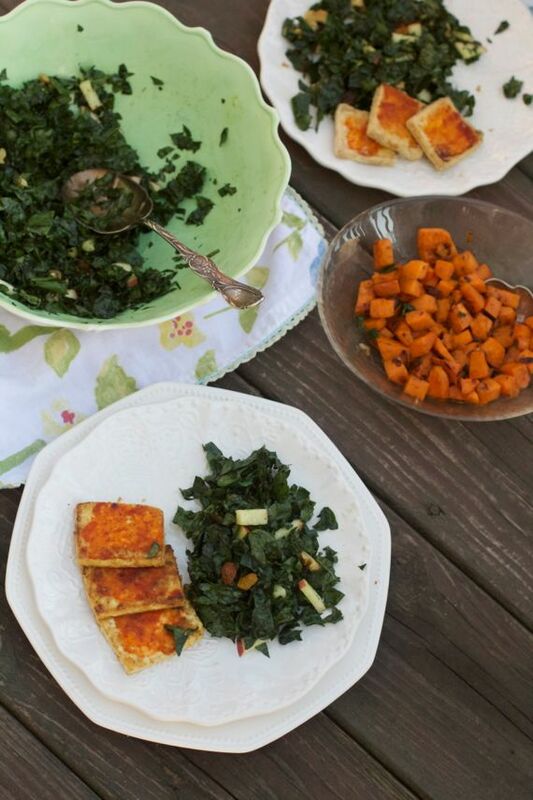 Another way to enjoy hot tofu, Southern style, is with a kale salad and apple salad and sweet potatoes. Please tell me if you’ve had Nashville Hot Chicken, and where you had it. My favorite place so far is Hattie B’s and I wrote about it here. A Southern twist on tofu, inspired by Nashville's hot chicken. Season boiling water with salt and cayenne pepper. Place tofu in baking dish. Pour water over tofu and let sit for 15 minutes. Remove tofu, place on cloth (waffle towel works well) or paper towels and drain for 15 minutes. Cover tofu on both sides, making sure to gently press out the moisture. Using a non-stick pan, put grapeseed oil in frying pan. Using medium heat, get pan hot. Cover tofu pieces with corn starch, only right before you pan fry or tofu will get too much moisture. Fry for a few minutes on each side until golden brown. Remove to plate with paper towels and immediately brush with sriracha sauce on each side.Rub sriracha onto the tofu, while it is still hot. Serve immediately. 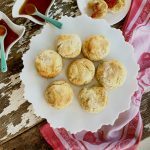 To make sliders, use soft mini white rolls or use white bread, cut into circles or squares, no crust. Serve with bread and pickles. Good for you to brave tofu. I am in awe of your dedication to get the texture right. They look delicious. 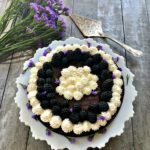 This challenge has given me a whole collection of great recipes for my vegetarian friends! There was an interesting video online from a chef who made vegan fried chicken. He used soy chicken of course, but he wrapped it in spring roll wrappers. Other than that, he did a double dip batter (with a few modifications for the liquid part) and fried as usual. It definitely looked crispy. Wonder if that would work to make a crust for your tofu? such a great idea for the challenge! i would definitely be scarfing down these sliders! 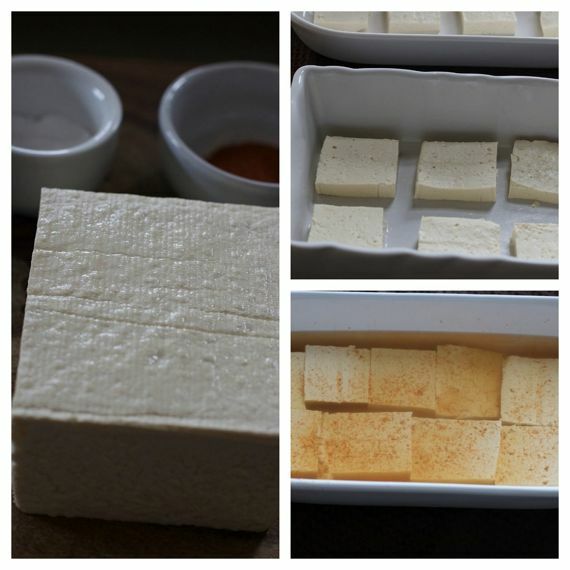 Corn starch is the key for frying tofu. Pass me a few of those sliders. An original take on sliders and I love it. And it was reading about the Nashville-isms! Your ” You’re so Nashville…” was hilarious!!! I think about these sorts of things all the time living in Berkeley ( so much to make fun of). We actually have a “How Berkeley Can you Be?” festival every year. Quite funny. Erin, That’s funny. I lived in Southern California for twenty years. I can pretty much imagine the “you’re so Berkeley.” My favorite Orange County one would be , “you’re so Orange Country, you have look up the calories in tofu before you eat it.” And then check with your plastic surgeon! I love hot chicken AND I like tofu, I bet I’d love this combination of the two. What a clever idea! 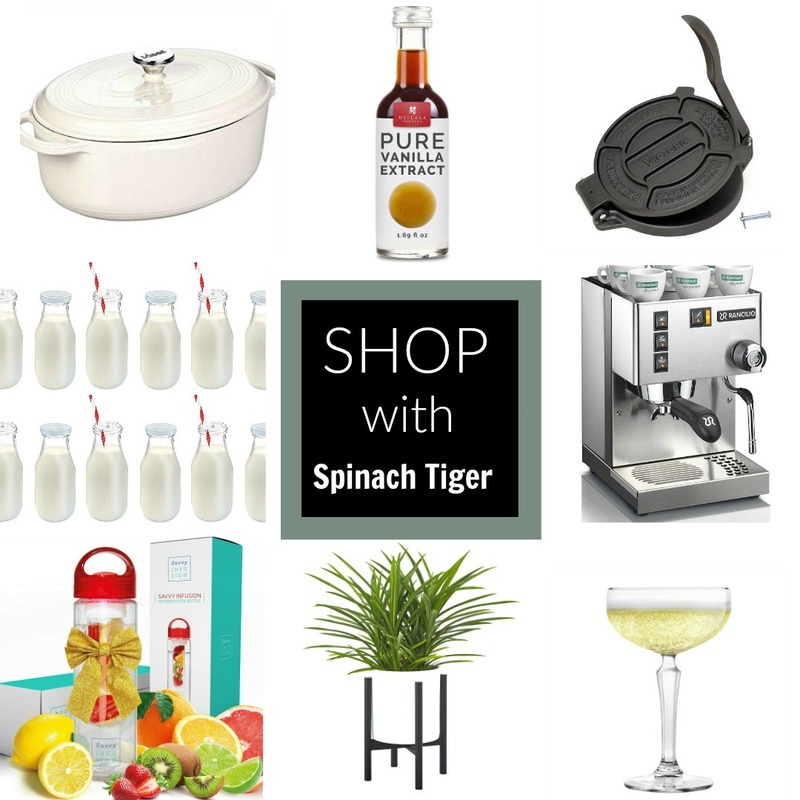 I am looking forward to the Kale recipe . I have fresh Kale growing in my garden as we speak . 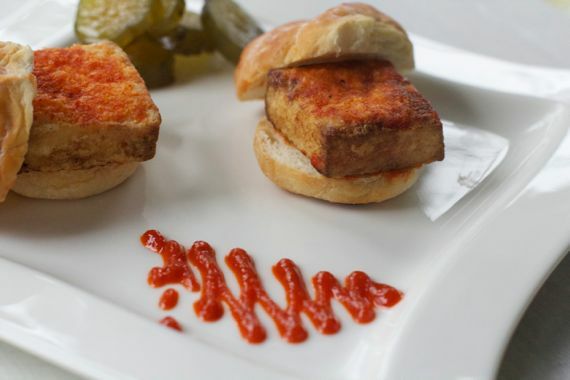 The Nashville Hot Tofu sliders look great ! I believe the breaded and fried tofu ( because a southern girl will always try the fried version ) I have eaten was breaded with Panko bread crumbs . They were crisp on the outside and oh, so soft and yummy in the middle …..I can hardly wait to trying this with a side order of fresh kale ! Kale is my favorite super food. I eat it almost every single day. Thank you SO MUCH. We get chickens every year at the local SPCA, and I plan to? adopt a cuolpe of them in a year or two, but until then, I don’t want to use eggs in my baking. 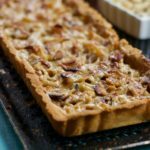 Those tips will be very useful to me, and it will be a pleasure for me to show my family how delicious and satisfying vegan baking can be. Got a good read on Nashville and you know its on my bucket list. I am glad you perfected your dish. I am a tofu lover and I cannot wait to try it. Excellent work my friend. You know Norma, I’ll be excited for you to come here. The sliders look great!!! …I’ve been making them for my sons who are grown now and have children of their own and they are now making them for their children!! …I season a little different still using cayenne pepper just a few more seasonings and I flour and fry until golden brown!! …It’s always been a winner!! ..I’ve made my own tofu for years until the boy left home.. now I purchase it! ..Extra Firm I like when making my sliders!! ..i’m looking forward to it your way!! 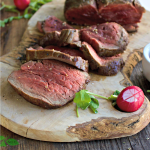 … two of my grands just like it sliced and seasoned with nutritional yeast flakes! ha ha!! I would love to see your recipe on that. I’m still learning all the ways to fry tofu. 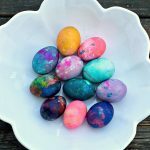 I loved reading this post, Angela! My favorite “You’re so Nashville if” was the one about the CSA produce…I had to laugh about the eggplant! I’ve been to Nashville once…I had BBQ of course and I enjoyed it just as much as I enjoyed the charm of the city. Your sliders are lovely. Faith I wish I would have laughed when she didn’t know what eggplant was. I had moved to Nashville two days earlier and I went out to the car and cried. I thought “oh no” where am I? Interesting sliders! What an original recipe. Really funny and great read Angela. And awesome idea of our vegan theme. You really thought, or slid, outside the box. Thanks, Evelyne, I try to be original. Vegan was a very hard challenge for me. 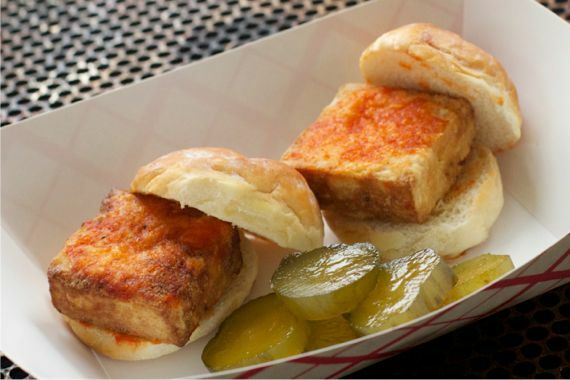 Fun post, Angela, with all the Nashville-isms, and those tofu sliders sound pretty tasty. Glad you stuck with it and got it to perfection. Well done! I do enjoy a good slider Angela. This one would be good for my vegetarian dad as well.